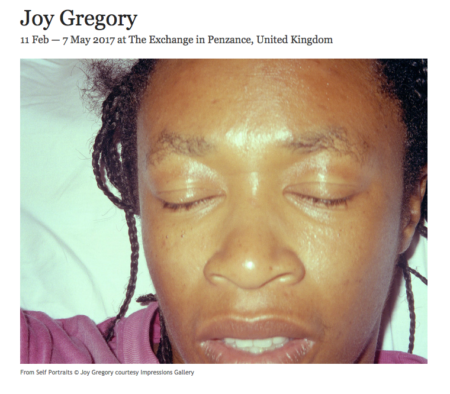 A major retrospective of work by Joy Gregory, one of the most significant artists to emerge from the Black British photography movement of the 1980s. Spanning 20 years, Lost Languages and other voices brings together 16 bodies of work exploring race, history and gender, encompassing a wide range of photographic media, from digital video installations to Victorian printing techniques. Joy Gregory was included in our recent group exhibition Liberties and this solo show, on tour from Impressions Gallery in Bradford, expands on those ideas while introducing new ones. The title of the exhibition refers to the works Gomera (2008) and Kalahari (2009) in which Gregory draws attention to the cultural importance of marginalised African indigenous languages. Journeys feature recurrently in Gregory’s work, which have been made in diverse locations including South Africa, the Orkneys, Sri Lanka, and the Caribbean. Cinderella Tours Europe (1997-2001) parodies the notion of the Grand Tour, with photographs of a seductive pair of gold high-heeled shoes travelling from the Caribbean to well-known sites in Paris and Venice; whilst Hoy/Hobart (2008) is inspired by the onerous journey from London to Hoy, a trip that took the same amount of time as one to Hobart in Tasmania. Assumptions about feminine beauty are also consistently explored. The Fairest (1998) and Bottled Blonde (1998) examine the desire to be blonde, whilst Objects of Beauty (1992 – 1995) critiques consumer products of the Western fashion industry. Lost Languages and other voices is an Impressions Gallery touring exhibition, curated by Anne McNeill. “As a charity that helps people understand the world through photography, we’re excited to see this exhibition shared with visitors in the South West,” said McNeill.